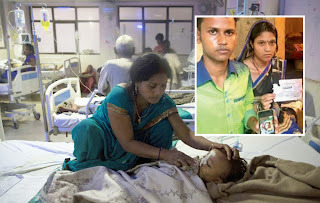 Holding the photograph of their baby close to their chest, Lakshmi and Shailendra are inconsolable two days after the death of their three-week-old son in Baba Raghav Das medical college and hospital. He was among the 17 infants who were not even a month old and were yet to be given a name, the records of BRD hospital in possession of TOI reveal. Death struck even before the parents could decide up on a name for the 17 babies. "We couldn't even complete his death rituals properly as we didn't have a name to address our son who was barely 20 days old," says Shailender, a resident of Jainpur village, about 15 km from the hospital. Most of the 17 babies got lung infection soon after their birth that required constant medical surveillance.They were sent to the hospital by doctors who mentioned in the reference certificates the need for continuous supply of oxygen. Iran from one hospital to an other with whatever money I had. On three occasions, I brought 350 ml blood from different hospitals. My parents had bought toys in advance. Unfortunately, we buried them all with him on Thursday when he was declared dead," says Shailender. Another couple from Basti district can't get over the shock of the death of their four-dayold daughter, whom they buried on Friday . "After our marriage in 2015, my wife Pratima conceived this girl. Everybody was elated until we learnt she had a respiratory illness. We were asked to take her to Gorakhpur hospital," says the father, Rajesh, a marginal farmer. He said he wanted to burn the medical records, too, but has kept it to show to the government as "there was little help given to us". In most of these cases, continuous supply of oxygen was recommended by doctors who had referred them to the Gorakhpur hospital. "Our one-day-old daughter was born with low weight and was asked to be put on oxygen support. Yet, the moment we arrived, we were told to use Ambu bags right away," said Sarika from Kushinagar. Sarika is yet to conduct the last rites. She is waiting for the death certificate of her unnamed daughter stating the reason for her demise.